Like any parent, I always expected that some of the values that form the crux of my existence would be passed down to my child in the womb. Like a penchant for bad puns. A love of good food. And a general sense of direction in any kitchen. Don’t get me wrong: I never wanted to breed my kid to be a Michelin-starred chef. I just sort of expected that any child of mine would be baking his own birthday cupcakes by second grade. That doesn’t seem likely. My son, Graham, arrived seven weeks early. Though we didn’t know it at the time, he was born with cerebral palsy, which explains why he’s progressed slowly in almost every way. He took 29 days to learn how to eat. He began to crawl an entire year later than most kids. He was way behind his peers when it came to learning to stick his fingers in electrical outlets—ditto for throwing food. And today, at nearly three years old, he still can’t stand on his own. Having a kid with a disability isn’t devastating. It’s disorienting. I’ve tried to ignore what all the parenting books say my child should be able to do. I’ve tried to be patient. But I can’t imagine not teaching Graham certain things. So in our little red leather notebook—the one that starts with a list of my first trimester food cravings—we record inchstones, not milestones. I like to think that Graham and I began inching our way toward cooking together when he was 10 months old. One morning while running errands, I noticed him squirming in his car seat as if he was trying to get out. This made me wonder whether he might finally be strong enough to sit up in the grocery cart instead of being strapped to my chest. I was giddy at the thought. I wanted my kid to look out in awe at aisles and aisles of food. I wanted him to reach for anything and everything he found curious. And I wanted him to touch the same green plastic bar every other snot-nosed kid had slimed. So I plunked him in the cart and there he sat, wobbly but upright, sporting the orthotic helmet the doctors had prescribed, poor kid. In that moment, it was clear to me that her kid was different, too–and that she wouldn’t have wished it any other way. I’ve never, ever wished Graham were any other way. But here’s what I do wish. I wish I’d pulled that woman aside, a pound of sliced salami still in my hand, and asked if she had plans the rest of the morning. I wish she and I’d given our children free reign over the cold cuts while we slumped down against the bread shelves, our elbows smooshing the oat bread behind us, and shared our stories. I wish she’d explained in no uncertain terms that her son had cerebral palsy. I wish I’d kept the calming image of this happy, patient mom and her bright-eyed, intelligent kid etched in my mind a year later, when my husband, Jim, and I sat next to Graham on a pint-size purple exam table at Seattle’s Children’s Hospital, stunned, as a nurse practitioner explained without emotion that our son showed unmistakable symptoms of CP. And I wish I’d revisited that image each time I started to panic about what this condition meant for Graham and his future, because maybe then I wouldn’t have felt so alone. The day Graham was diagnosed, an intern handed us some information on parenting children with CP, the name of a school for disabled children, and a juice box. But I’m not the sort that follows parenting handbooks. Besides, there were things I wanted to know that the doctors couldn’t tell us–enough to fill umpteen handbooks. Like when Graham would learn to walk or tie his shoes. If he’d ever have the balance to ride a bike. And if he’d someday stand at the counter long enough to learn to make scrambled eggs with those scrambled legs. 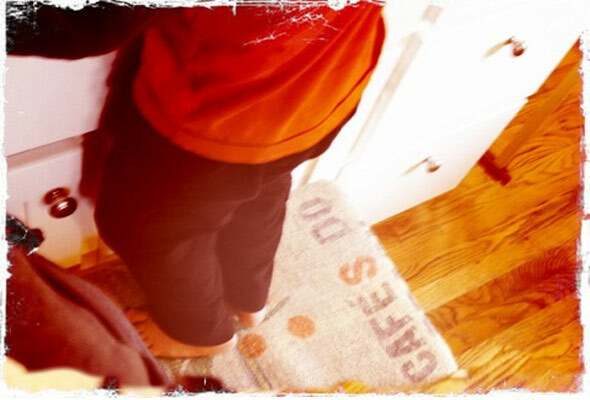 Given what we’d been told about Graham’s calf muscles being permanently clenched—which explains why he could only attempt to stand on his super tippy-toes with very poor balance—I couldn’t imagine my son ever stirring and measuring and mixing alongside me. So when he became too big to hold in one arm while I cooked, I had no choice but to leave him playing on his own whenever dinner called. Each time I walked into the kitchen, I felt like I was leaving a piece of myself behind. I tried, I really tried, but I couldn’t fathom not teaching him to cook. So whenever I made something, I distracted myself from our current reality by brainstorming tasks Graham might be able to do one day. Surely, I thought, once he could stand and balance on a stool with a little help, he could toss some chopped carrots and celery into a pot of soup. Spill breadcrumbs on the floor. Maybe help mash some potatoes. This continued until Graham turned two. That’s when we found a savvy pediatric neurologist who asked what sorts of things we dreamed of doing with our son as a family. My husband and I explained that we used to ski every weekend before Graham was born, and that we’d love to continue that little tradition. With the neurologist’s help, we figured out how to turn Graham’s walker, which makes him look like the world’s tiniest old man, into a sort of snow-friendly battle cruiser. It was an approach that calmed the parental panic so intertwined with raising a disabled child, and helped us understand that yes, we needed to change our approach to raising a kid, but no, we didn’t need to change everything about our lives. That’s when I got a blinding flash of the obvious. I’d bring the kitchen counter down to Graham. There, more than three feet below my cutting board, on the slick wood planks between our oven and cabinet, Graham began to “cook.” At first we’d just shuffle things around together. I’d give him a bowl of multicolored baby potatoes small enough for his little muscles to pick up, and together we’d transfer them to the roasting pan and I’d let him pretend to salt and pepper them. Many nights we ended up with olive oil on the dog or a potato wedged underneath the dishwasher. I didn’t care. It was the closest he and I’d ever come to cooking together. In time I came to understand that cooking with Graham didn’t necessarily mean standing next to him. It could mean him playing on the floor in the kitchen, feeding his dump truck imaginary strawberries, while I stirred risotto. Or him smearing cream cheese on the oven door while I microwaved fish sticks. (My son may know how to order “Chicken pho, please!” but as the mother of a toddler, I am not above frozen fish sticks.) Or him plunking cans of sweetened condensed milk, plum tomatoes, and coconut milk in a stainless steel bowl, banging them loudly with a potato masher, and then presenting it to me proudly, saying, “Mommy, I made you cauliflower. Do you like it?” It can be anything, really, as long as we’re together and one of us has the undeniable intention of feeding the other. Graham’s now strong enough to lift the head on our stand mixer with one teensy hand while he holds onto the counter for balance with the other. He’s a big enough little man to pull the fridge door open, hoist his body up, and lean against the shelves while he just stares at the food. And last December, he was able to stand on a chair, rest against the cupboard, and craft hexagon-shaped Christmas cookies by jackhammering aspic cutters into cookie dough, pounding and massaging every single molecule of butter into the counter, and triumphantly announcing, “And then…it came to be…TWO HEXAGONS!” These are the moments I now jot down in our little red book. I’m not proud of my child for singlehandedly reinventing cutout cookies. (Although, you’ll see. Next Christmas, hexagons will be the new stars.) I’m proud of him for having the strength to stand at the counter and cook. And I’m proud of myself for having had the patience to wait for him to be ready. And I know that someday, when I can trust him not to fall into the gas flame, and when he’s over his irrational fear of egg yolks, together he and I will make scrambled eggs. Photo © 2012 Jess Thomson. All rights reserved. All recipes and photos used with permission of the publisher.